The team went to Arba Minch University in the morning to present an LCS lecture. However, the university talk had to be postponed due to the low attendance. We talked with Alemayehu, Vice President in the university administration and the public relations office for a reprogramming of the LCS presentation, as the advance communications about the event seemed to have broken down, so there had not been any wide promotion of the talk. We rescheduled it for Monday 22 September 2008, whilst understanding that this was a difficult period as several staff were away on a curriculum review and many students busy with examinations. In the afternoon, the team visited the offices of Gughe Indigenous Art and Music Association (GIAMA) and Center for Indigenous Questions (CIQ). The imminent Festival on 13-15th December 2008, would include not only the 56 S. Ethiopian 'nations', but performers from Kenya, see http://www.gughe.org/ . They want to ensure that performers themselves benefit from the sales of videos etc of the event through promotion of copyrights. GIAMA have been building up analogue archives of music and traditional knowledge such as in healing medicine and want to build up a resource centre on traditional cultures for universities and others. 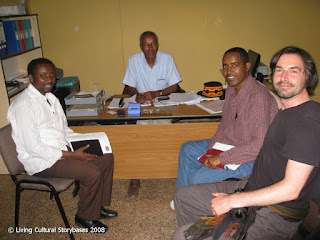 LCS noted the increased potential if archives have been digitized, the attraction of also inviting master storytellers to the 1000 Stars Festival and the LCS methods for including the whole community in a celebration of their oral traditions via multimedia exhibitions, the Internet as distribution and two-way communication medium, and potential use of mobile devices. What is the guarantee for the digital equipment that LCS gives to children or youth in communities for story recording? Can’t it go missing or even get lost? How easy would it be to attract the young generation and get them engaged in revitalizing traditions, as the young are highly attracted by aspects of the stream of modernization ? From experiences in other communities, LCS has observed that youth recruited for LCS work are very happy with the training and skills they acquire and the whole operation. They are very proud of using the digital gadgets, often several other community members follow them when they are recording, photographing and playing back or exhibiting their recordings. So, they are seen to care for the equipment, do their job with pride and are happy with the recognition they get from their elders for helping preserve their culture. In fact, the strength of the LCS approach is in the trick of combining the interest of the young in using digital gadgets or the Internet with the desire of the elders to have their voices heard and their traditions respectfully appreciated by the young. Ato Lemma (Executive Director), Tarekegn Shado and other staff members warmly received the visiting team at the CIQ office. 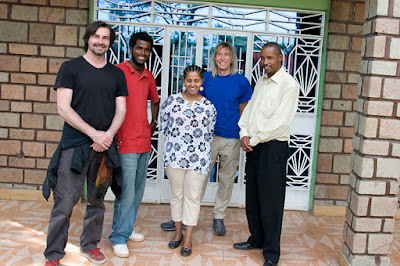 CIQ is a relatively new organisation, fostered by seed capital from The Christensen Fund (who are sponsoring much of the cultural diversity initiatives in Southern Ethiopia through several NGO's). CIQ has been licensed for NGO work since Dec. 2007. CIQ's aim is to provide assistance for indigenous community associations, or ICAs. (In 1997, there were only 3 ICAs, now there are 63.) CIQ provides advocates and consultants. Their goals include running training workshops in technology or finance, helping establish community bylaws, governmental recognition or in application for grants. CIQ will subsume some of the work of the Culture and Arts Association (CASE), which for example have helped build capacity in the Gammo Weavers Association (35% supported by TCF). CIQ have arranged an Arba Minch workshop on biodiversity, seeds and trees, sacred sites and forests. About 7 or 8 ICA's are currently helped by CIQ. Many more in the large Gammo region also want assistance, but CIQ has limits on how fast it can grow. Both parties exchanged ideas on the missions of their organizations and saw many possibilities for collaboration bringing complementary approaches to cultural re-vitalization. The CIQ staff provided the LCS team with the necessary information to set up contacts for the subsequent visits to Konso and Aerbore communities. After another productive day with many new contacts, the visitors returned to their Arba Minch eco-lodge for the night.